We can offer you a career (not just a job) in a growing industry with vast opportunity. We value our employees understanding that they are the backbone of our business; we couldn’t do what we do without our team! And it doesn’t stop there… We believe that no one has arrived; we think it’s important to be in a constant state of getting better to progress forward, so we provide all-in training and upskilling in the specific trade you’ll be employed under. We’re also committed to developing leaders. If you’re great at leadership (or you want to see if you are), we want to help develop it with our internal Leadership Development Track, utilising what you have for an even more rewarding job and position in our company! Do you think you could be a site foreman? If you’re a natural leader and you can encourage, motivate and build strong relationships with your team, you may be just right. You also need to be able to set productivity targets for your team and then work together to reach them. If you’re particularly ambitious you exceed your remit, you can take advantage of our reward programme – if you do a better-than-expected job you earn more! One of the great things about being a site foreman is building a team and seeing everyone enjoy their work, you included, of course. Our bonus structure rewards people who go that extra mile and we also have built-in leadership bonuses for people who take on extra responsibility. We’re only as good as our people, which is why we want our people to be good – if you can get the best out of your team and still have a laugh with the, you’re the sort of leader we’re after. Are you a skilled, hard-working renderer? And are those skills appreciated enough where you are now? If you enjoy working in a team that understands and values your skills, where you’re rewarded well for your hard work, we might be the right people for you. You might be particularly interested if you have ambition and want to move onto bigger things while passing on your skills to the next generation. 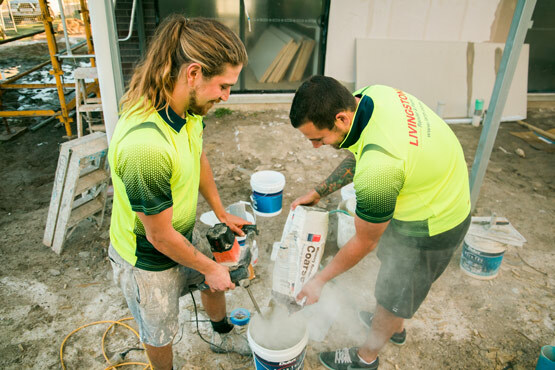 If we seem like a good fit for you then you’ll be delighted to know we’re looking for hard-working renderers with energy and experience and who love the buzz of working with a team of like-minded people. Best of all, we have a great bonus structure that rewards effort and initiative. If this sounds like what you want, give us a shout. Are you looking for a apprenticeship? If you’re just out of school or college, or if you’re looking for a new direction, a career in construction might be right for you. It’s not just a job, it’s an opportunity to learn a trade, especially if you’re energetic and motivated. You’ll never be short of work and you’ll be working with a caring team that wants to help you to learn. Even better, you could earn bonuses for working hard and for contributing ideas – no matter how young or inexperienced you are we believe you have ideas and valuable insights and we want to hear them. We have a bonus system that rewards every member of the team for high levels of productivity, so even though you are new to the trade you can be rewarded for your effort. If you feel this is something you identify with and want to be a part of, we would love to hear from you. If you’re already running your own business and you’re looking for some top-up work for yourself or your staff members, we may be able to help each other, especially if great service and quality is important to you. If you’re spending lots of time chasing up invoices, or doing your own marketing, we can take on some of that burden. By forging relationships with great renderers from other businesses we can give out clients a brilliant service while giving our pool of contractors lots of opportunities. These opportunities range from small one or two-day jobs to long-term contracts. If you’re new to us we offer one of our own experienced renderers to come and work with your crew – at our own cost – for the first two jobs. This makes for an easy assimilation into your way of doing things.